After a new WSUS server had been installed in our corporate network, many Windows clients could not receive new updates from this server with the error 0x80244010. As it turned out, this error is typical not only to the computers that are updated from the internal WSUS server, but also to the devices that receive updates directly from Windows Update servers. Let’s consider the way to fix the error 0x80244010 and restore Windows update subsystem functionality. The most interesting line is the error “Exceeded max server round trips: 0x80244010″. It means that the maximum number of requests to the update server (WSUS) has been exceeded when scanning for updates. This is also indicated by the Windows Update error code according to the table (SUS_E_PT_EXCEEDED_MAX_SERVER_TRIPS). The server disconnects a client that has exceeded the maximum trips number. The trip limit in the Windows update receiving protocol is set on the update server and is 200 trips by default. There is also a limit on the maximum size of an XML file that a client can download from the update server during a trip – 200 KB. The greater number of updates on the server for the client to check, the larger the size of the XML file being downloaded. 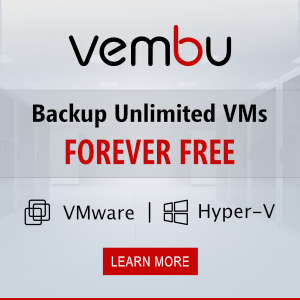 If a client fails to obtain the necessary data in 200 trips, it is temporary disconnected from the server and returns the error 0x80244010. As a rule, this error occurs due to the poor or unstable network connection to the WSUS server or if a client needs to receive too many updates (it is a new WSUS server client or a computer, on which the updates haven’t been installed for a long time). Important. After you start the search for updates, you should wait for 15 minutes for the previous cycle of update search to finish. In most cases it can solve the problem, but if there are a lot of clients in your network, this method is not acceptable. By default, a client checks the server for updates every 22 hours (actually, it is between 17.5 and 22 hours). Usually a working computer is turned off for the night, and its workday is obviously less than 17 hours. Thus, the updates search is performed once a day and it fails. And so it goes day after day. 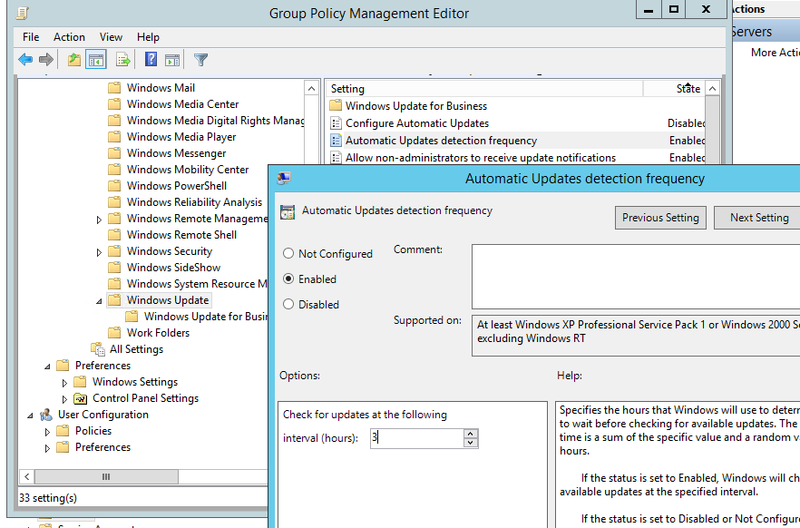 You can synchronize it more often using group policy “Automatic Update detection frequency” (you can find it in the section Computer Configuration -> Administrative Templates -> Windows Components -> Windows Update), for example, up to every 3 hours. You can also remove the limit on the maximum XML file size that the client can download from your WSUS server. To do it, run the following command in WSUSDB database. 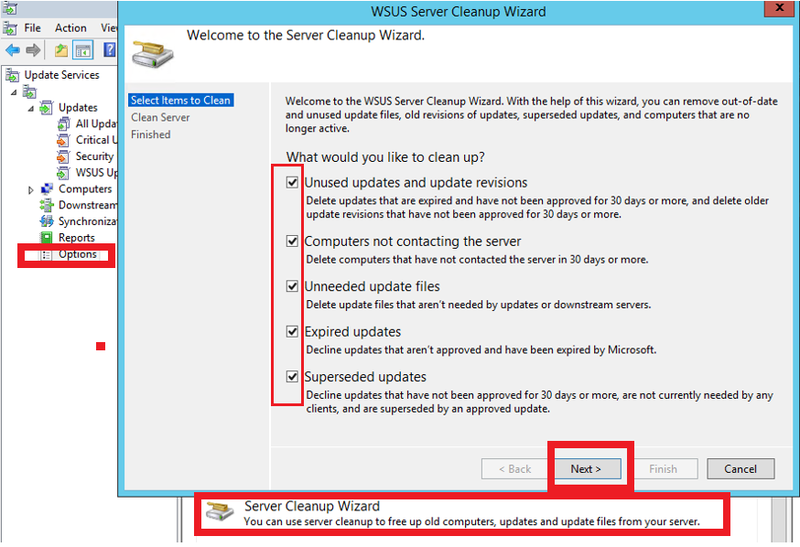 If you don’t want to change your WSUS database settings, clean up your WSUS server using the integrated Cleanup Wizard (Update Service console -> Options -> Server Cleanup Wizard -> all options -> Next) and remove old, not used or replaced updates (MS Office updates contain a lot of odd things). As a result, a Windows Update client will get less meta-information from your WSUS server, and the interaction should fit in 200 sessions of 200 KB each. Also, if there are a lot of WSUS server clients, you can increase the performance of WsusPool according to the recommendations in the article Fixing Windows Update error 0x80244022. If neither of the methods we have considered helped to fix the update error on a client, run the script to reset Windows Update Agent settings on it and clean up your local cache. After that, try to search for updates several times.